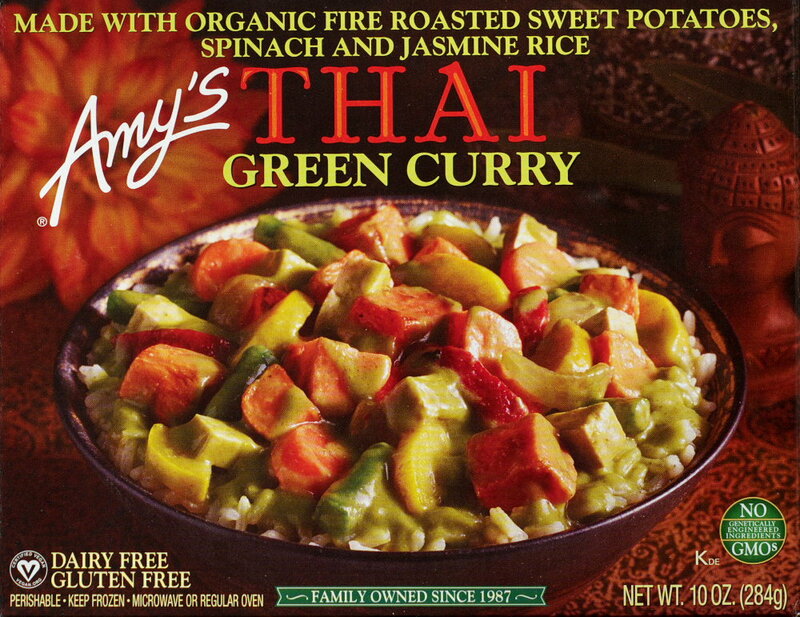 Certified vegan, certified organic, non-GMO, dairy-free, gluten-free, family owned, 100% recycled paperboard carton and re-recyclable, Amy ticks off almost all the check boxes. It even tastes pretty good. The green curry is medium spicy. More than the heat, it also a nice flavor. 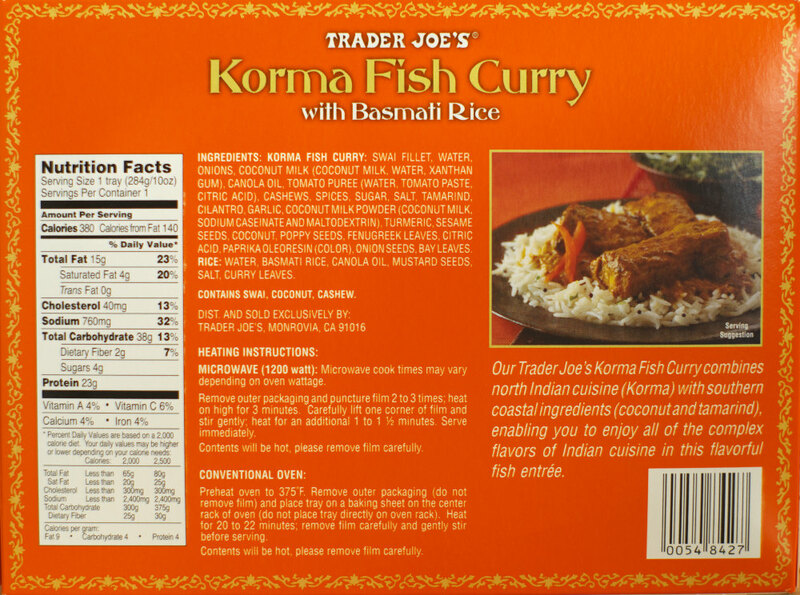 The flavor is not as complex as what can be found at a good Thai restaurant, but still nice by frozen box-food standards. 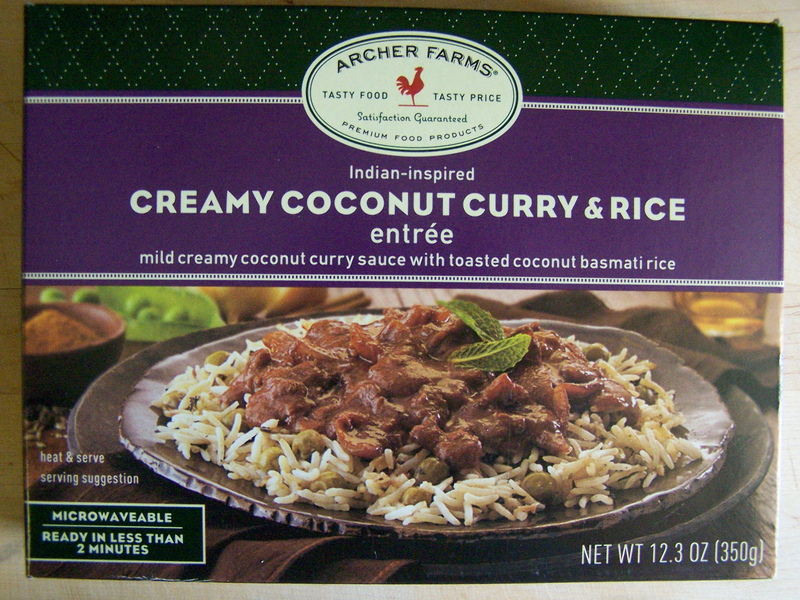 The rice and vegetables are a bit softer than I like, but not overly so. 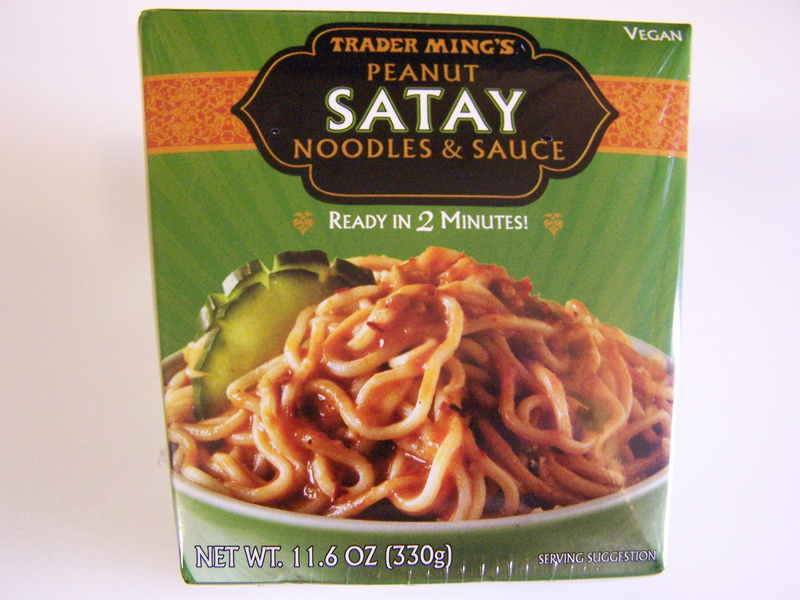 Like many commercial products, the amount of sodium in the product is on the high side, 780 mg. At 360 calories per container, it’s a light lunch, but still filling. 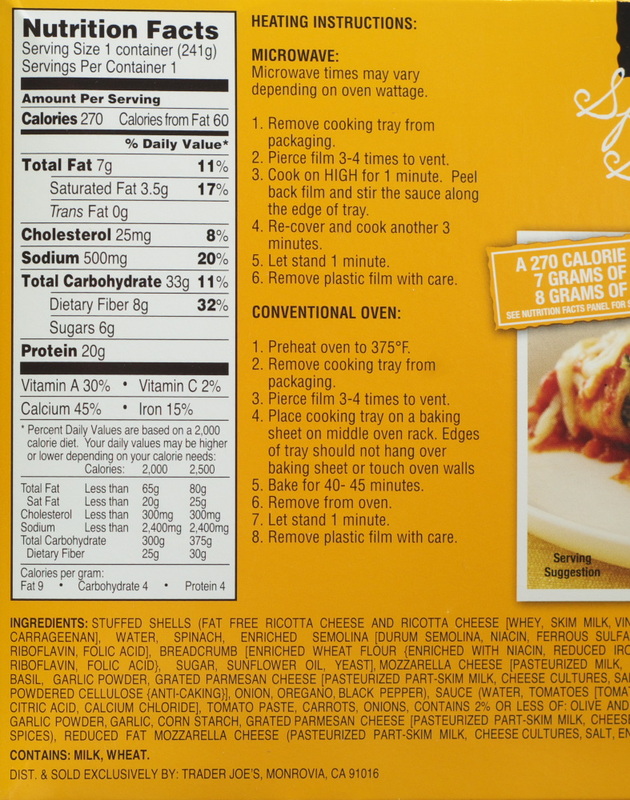 The$3.75 sale price is getting up there for a single portion frozen boxed meal. However if you need one of those check boxes listed above, this product could be for you. The microwave has never smelled this good. If this was just a big bowl of the sauce, I’d be perfectly happy. 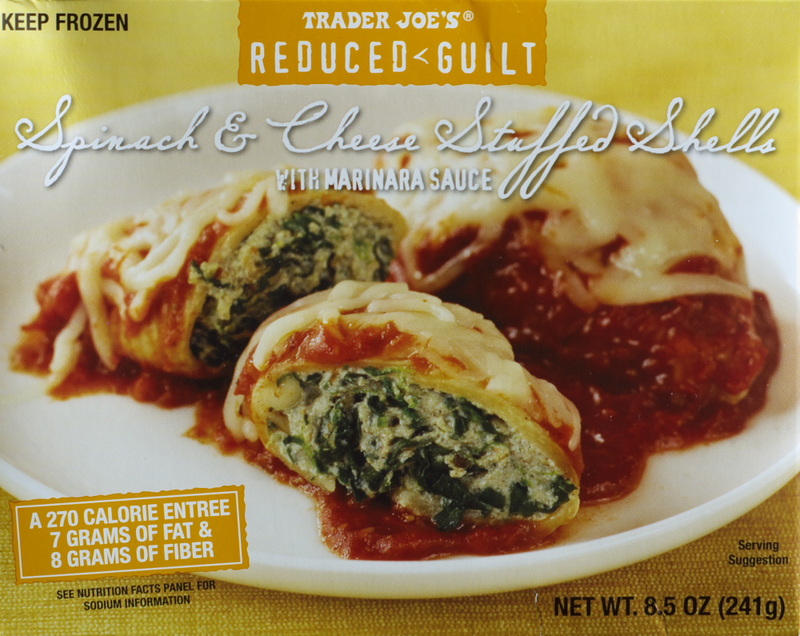 Complex flavors in the sauce kept the mouth happy. Little bits of seasoning were like Easter eggs in video games, pleasant surprises that made each bite a slightly different adventure. Be aware, this is not for the squeamish. Along with the flavor is a medium heat in the mouth changing to a hotter burn in the throat. The fish was firm and not oily. 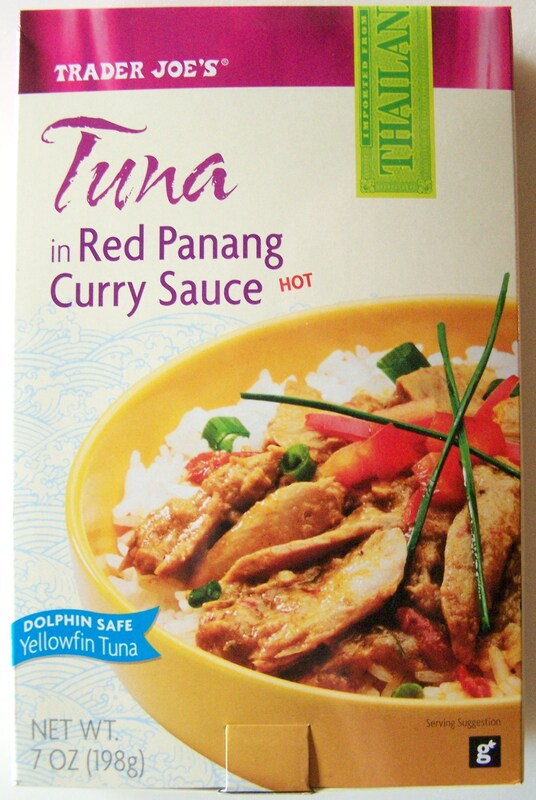 It’s hard to tell if the fish added any flavor to the dish because the sauce overwhelmed it. My dinner contained a nice large thick piece of fish. 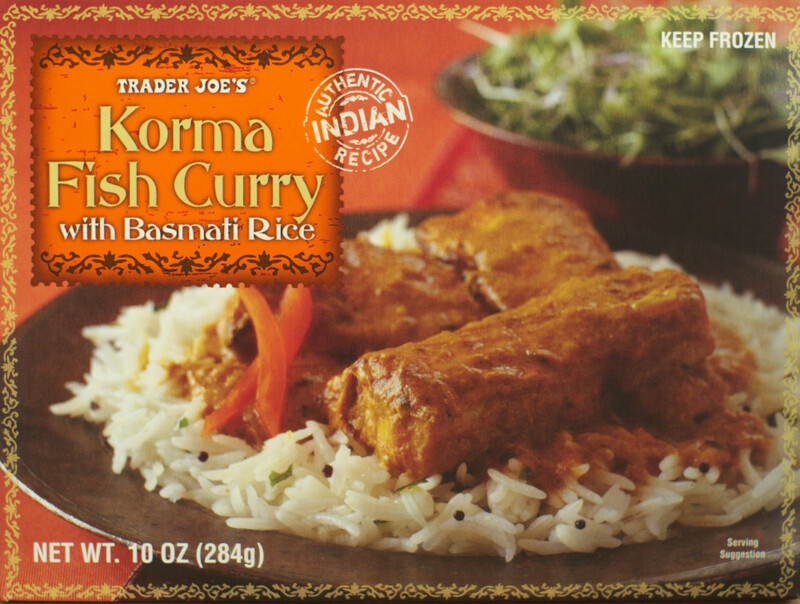 The basmati rice was also nice having separate dry grains of rice with a firm texture. The rice had a slightly different taste, most likely due to the seasoning in the rice. A bite of the rice also mediates some of the heat from the sauce. 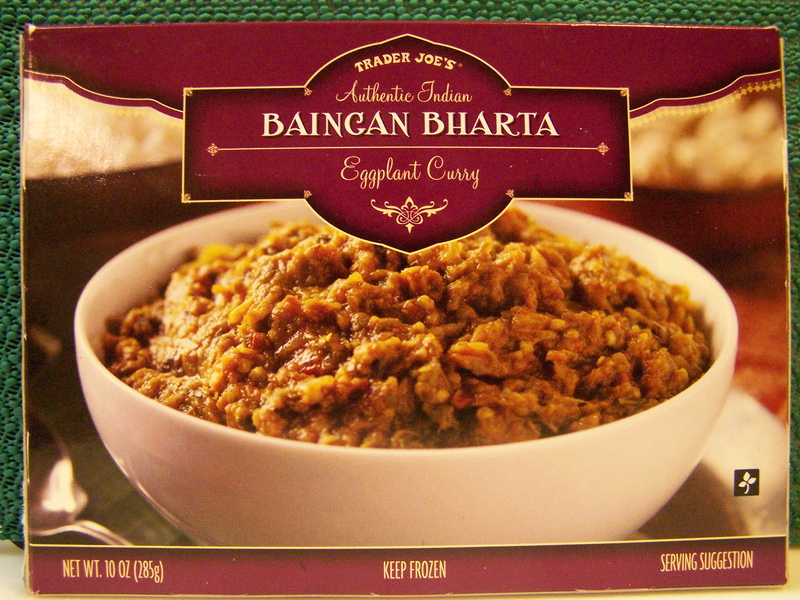 For anyone liking good spicy food, this should be at the top of your list to try. This can add and remove chest hair. Both at the same time! 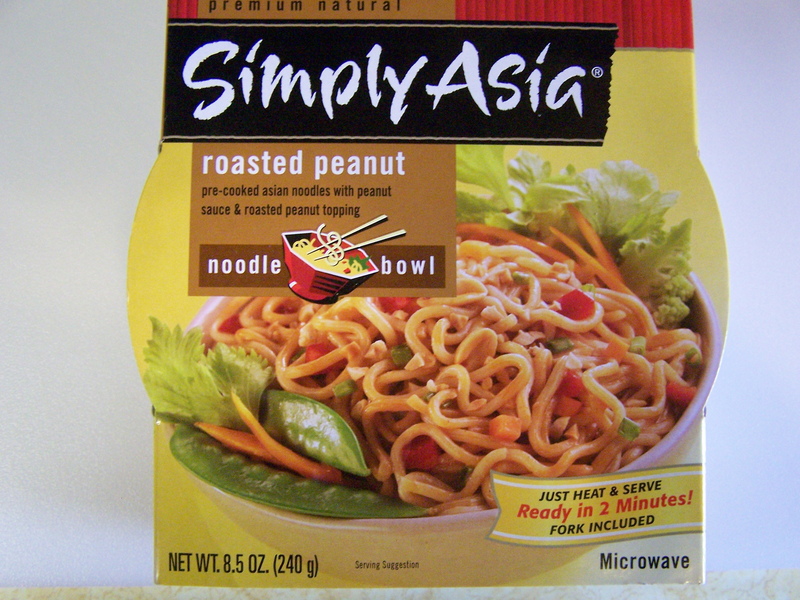 Compared to the distant memory of the last boxed noodle bowl I ate, these are better. But they still might be better used stored in a survival kit that we hope never needs to be opened. First green, now red. I hear there’s a yellow. That spells traffic light. 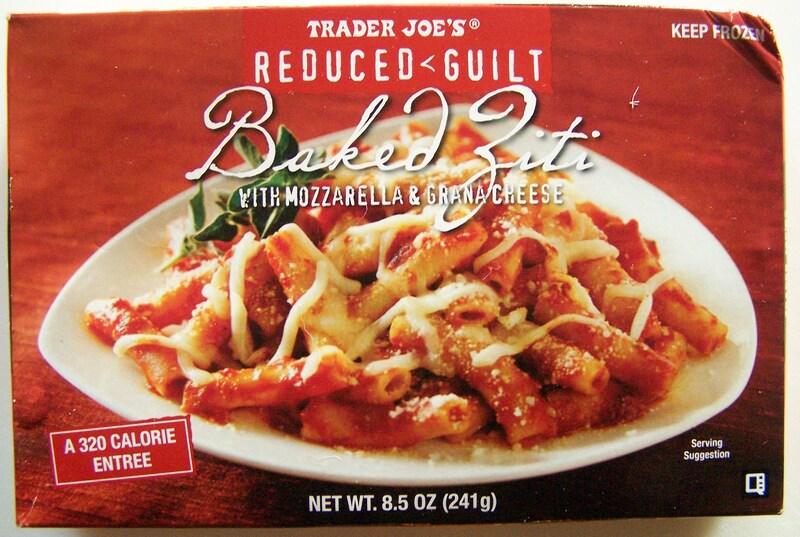 I’m feeling guilty. Guilty for buying this. If you don’t like these you can always try them as fish bait. 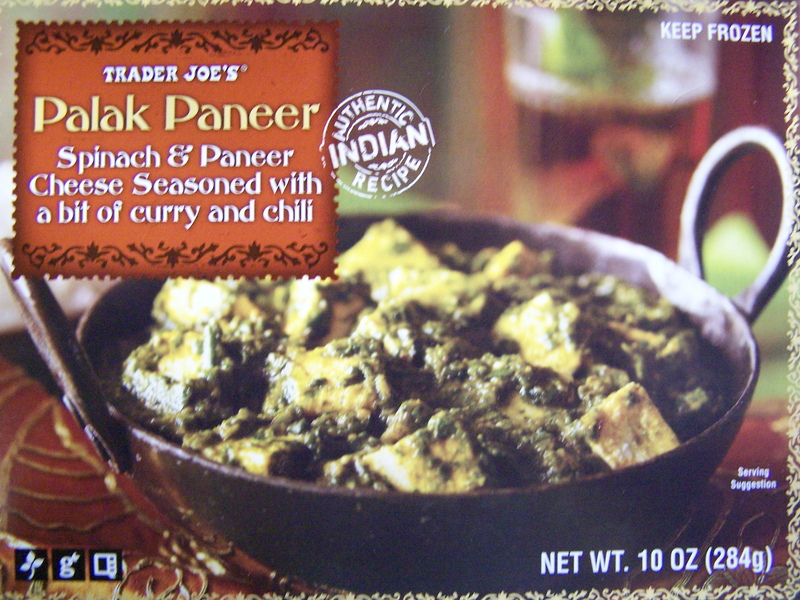 Just to confuse us again, Trader Joe’s has two products called Palak Paneer. This is the frozen variety and it’s a step up from the canned in a pouch kind. Still in decision mode on this one.